Charles Ives, Umberto Giordano, Osvaldo Golijov, Paul Hindemith and Alban Berg all wrote music for accordion. So did Piotr Ilyich Tchaikovsky; in fact he wrote a score that calls for four diatonic button accordions. 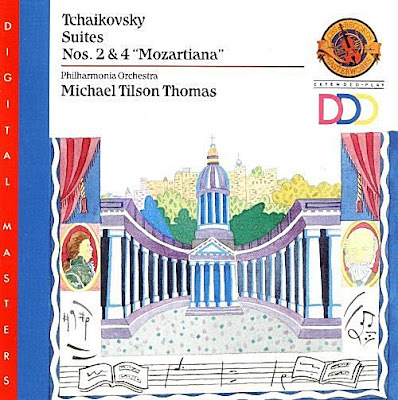 Tchaikovsky's Suite No. 2 for Orchestra is not as well known as the Suite No. 4 'Mozartiana'. Which is surprising: as they say on Amazon, if you like Tchikovsky's ballets you will like his Suite no. 2. Or is it because, as they say in the music director's office today: - if your score needs four accordions don't expect us to programme it? I have Michael Tilson Thomas' recording with the Philharmonia Orchestra; which also includes 'Mozartiana'. The performance is excellent as is the sound. The latter is explained by CBS sub-contracting the recording to EMI. The venue was Abbey Road Studio One in 1981 with EMI's Neville Boyling at the mixing desk. My research indicates that this CD of the two orchestral suites is currently only available as part of a Tchaikovsky symphony box. Now read about Wagner rescored for accordion. Another little-known cracker is Tchaikovsky's Suite No. 3 for Orchestra. Back in the 1970s EMI's Douglas Pudney suggested to Sir Adrian Boult's producer Christopher Bishop that the Suite No. 3 was worth Sir Adrian recording. The result was a gem of an LP. It is still available as part of a 2 CD Tchaikovsky compilation. Worth buying for the Orchestral Suite alone. The late Douglas Pudney was the catalyst for many fine recordings. I hope to publish a tribute to him later in the year. Years ago, I found a recording of Beethoven's Fifth played by an accordion orchestra from the States. It was not a transcription. Each orchestral part was accorded to an accordion. It was interesting, I must say. And if Tchaikovsky's 2nd Suite is hard to recorded because you need four accordions, how on earth did we get more than a handful of recordings of Arnold's A Grand Grand Overture? I guess there are more Hoovers out there than squeeze boxes. Quite so David. But you try getting Arnold's A Grand Grand Overture performed today. Is the absence of works including accordion from programmes today (except for the ubiquitous Osvaldo Golijov) due to the credit squeeze? This brings up the subject of how anything "folk" is perceived by the supposed musical elite -- both music and instruments. See: John Jacob Niles, for instance. The only exception to this seems to be if it comes from somewhere else -- i.e., the performer is always been if they're from a long ways away. "Folk" instruments are respected if, say, they're a Shakuhachi, but not, say, the nearly identical Native American instrument. I guess it's because the assumption is that "folk" music and instruments aren't "educated" properly, and therefore can't possibly contribute anything to the realm of "proper" music? I don't know. All I know is that the best composers pretty much all appropriated folk tunes and sometimes folk instruments...even Mozart. It's never seemed to me that the 'musical elite' are particularly snotty about the instruments of Western 'folk' music, or the music itself, but perhaps AS is right and it has escaped me. Anyway, this discussion reminded me of a disc I came across browsing in the library. It bears the title Bach Sonata and Partita No. 1 for Violin adapted for 5-string Banjo, and the performer is one Eugene Chadbourne. I rather liked the idea of Bach on the banjo, though I thought the choice of works rather odd, so I gave it a listen. Quite horrible, really, and in parts sounding very much like something which, unaware, you might suppose third-drawer Japanese. It can be sampled by googling 'Bach Chadbourne Artist Direct' and as an example of a real curio it's worth a listen. I have the same Tilson Thomas Tchaikovsky suites recording, but the original LP not the CD. I love the Suite No.2 and the first time I heard it, years before, it was definitely those accordions that charmed me.